Income Activator provides you with a ready-to-go website, with pages, forms, links and pictures. Simply drop in your content, or we can customize your website for you to the look and feel you want. No cookie cutter websites here! 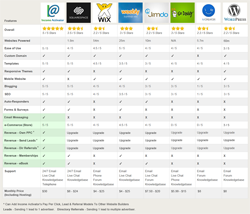 Compare Revenue Models with other website builders. 10 revenue models that you can activate for no additional costs to make money online. Survey Monkey - Income Activator's website builder is better than Survey Monkey. Survey Monkey is used to create surveys and there are additional costs as you increase the number of questions or surveys. Income Activator provides the same service with an unlimited number of questions that can be asked and forms created. This data is also able to be downloaded into Income Activator's email messaging section for you to communicate with your respondents. GoDaddy - Income Activator's website builder is better than GoDaddy, as GoDaddy's set up is hard to maneuver around. Updates are slow and the store is an add-on that has an additional cost. Income Activator's setup is easy and can be learned by watching simple how-to videos. Each feature can be found on the top menu when you log in to the back door of your website. Weebly - Income Activator's website builder is better than Weebly. With Weebly your online store is limited to PayPal only and its forms do not have auto-responders. There is no email messaging. Must we say more? Wild Apricot - Income Activator's website builder is better than Wild Apricot, as it's main focus is on membership sites with no other revenue models like an online store, pay per click, or lead generation revenue models included.